CROWNING MOMENT: Princeton University mens lacrosse sophomore star Jack McBride, center, prepares to fire the ball in No. 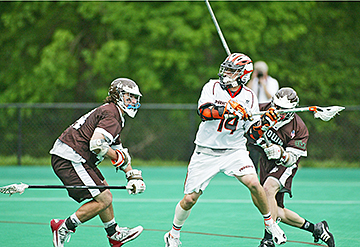 4 Princetons 11-7 win over 10th-ranked Brown last Saturday. The victory earned the Tigers a tie for the Ivy League crown with Cornell. Princeton, now 12-2, will open play in the NCAA tournament where the the fourth-seeded Tigers host Massachusetts (9-5) on May 10. Six cases of H1N1 influenza, or swine flu, have been confirmed in the state of New Jersey; however, to date no cases have been identified in either the Princetons or in Mercer County. In operation since April 2008, the Boroughs FreeB Jitney shuttle service has seen 4,851 rides in its first year, Administrator Robert Bruschi reported at the Council meeting last Tuesday. Swearings-in, the election of officers, and contract approvals took up much of the Princeton Regional Board of Educations annual organizational meeting last week. Even in a harsh economic climate, Borough resident Mitchell Synakowski has been able to find and keep his job for the past 14 months. At their meeting on Monday evening, Princeton Township Committee members approved the introduction of an ordinance that will fine-tune the existing law regarding canine misbehavior. Instead of the current law, which covers the gamut of infractions from tearing up bushes to biting people, as Township Attorney Edwin Schmierer described it, the new law would distinguish between inappropriate behavior and biting incidents, with a $250 fine for the first biting offense, and $500 for the second. A $75 fine would be imposed for all other offenses. A public hearing on the ordinance will be held on Monday, May 18. There was a sense that Neil Karandikar might be one of the best players in the area as he breezed to victory at second singles in the Mercer County Tournament (MCT) in his first two seasons with the Princeton Day School boys tennis team.